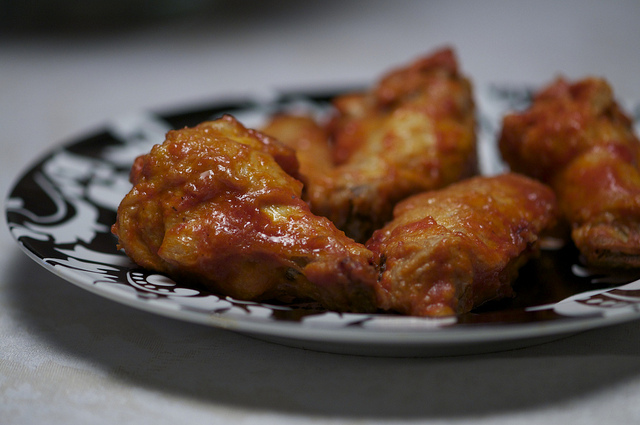 We love Buffalo Hot Wings and they are so easy to make yourself. :) I actually made these for dinner last night. Pat the wings dry with paper towels and set aside. Mix flour, pepper and salt in a gallon size plastic bag. Add the wings and shake to coat. Throw the bag in the refrigerator for an hour or so and go read your favorite paranormal romance or urban fantasy novel. Oh, turn on the oven before you go… to 425 degrees, so preheated and ready. Come back…. and line a large baking sheet with nonstick foil or parchment paper. Dip wings in Buffalo Sauce and place on baking sheet or put the wings on the tray and spoon the sauce on them.